Last week I told you a little bit about the Missional Women Conference. I hope you're as excited as we are! 16 speakers, incredible worship and we believe you will walk away inspired and equipped to live on mission for Jesus in the unique way He has built you. 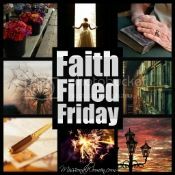 If you haven't read about the conference, read last weeks Faith Filled Friday post or hop on over to the conference website. For the first 20 ladies to register, we are giving away all of these 4 books FREE. 1. Beholding Him, Becoming Missional. The 12 week Bible study I wrote that takes you through First Samuel. 2. Newly released Devotional Journey through Judges. The devotional I wrote taking you through the book of Judges. 3. Reach; How to Use Your Social Media Influence for the Glory of God which I wrote with Missional Women Contributor, Angi Pratt. 4. Leading Effective Bible Studies; A Practical Guide for Transformational Small Groups. A book to help you lead a Bible study no matter if it's your first time or twentieth. Early Bird tickets go on sale Black Friday! And there's only 50 of those available. I saw your link party on Fellowship Fridays. This is not my first visit. I'm glad to be joining your party today and thanks for hosting. My two links are the free eBook for moms (not everyone who contributed is a born again Christian, but I am and I was one of the contributors) and the Make My Sat Sweet where I have posted things that I'm thankful for and where you can link on my blog hop too! God bless! Thanks for hosting this - just linked up!